Extremely soft towels that ensure a perfect finish! 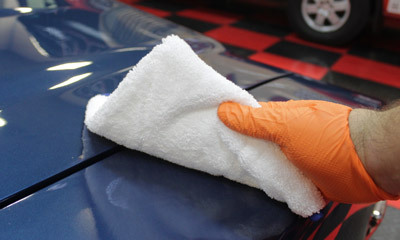 SONAX Ultrafine Microfiber Cloths are perfect for buffing off any type of product from your car’s paint! These SONAX Ultrafine Microfiber Cloths are composed of an immensely soft 85/15 polyester and polyamide blend that wouldn’t be able to scratch your car’s surface, even if you tried! The rounded corners and seamed edges of the SONAX Ultrafine Microfiber Cloths further ensure your paint’s safety while using these cloths! Each pack of SONAX Ultrafine Microfiber Cloths also comes with three color-coded towels so you never have to worry about mixing up which towel you buffed off your polish with and which one is clean and ready to buff off your wax! Finding the towel to buff products off your paint is just as important as the product you are buffing off. There is a lot that can go wrong in the process of buffing products off paint and if they do, the results can be disastrous! The SONAX Ultrafine Microfiber Cloths have many different features that ensure these risks are reduced to the absolute minimum! SONAX Ultrafine Microfiber Cloths are extremely fleecy and soft! With an 85/15 polyester and polyamide blend, these towels are some of the softest buffing towels on the market today. Couple this with the rounded corners and the seamed edges of the SONAX Ultrafine Microfiber Cloths and you get one of the safest towels on the market! This ensures that you don’t have to worry about marring your paint that you just spent hours polishing to perfection! SONAX Ultrafine Microfiber Cloths are extremely gentle on paint to ensure a perfect finish! Another added benefit of the SONAX Ultrafine Microfiber Cloths is the color-coded edges! If you accidently use the same towel to buff both your compound and polish, you’ll inflict some serious marring in your paint, forcing you to go back and polish that area again! The color-coded edges of the SONAX Ultrafine Microfiber Cloths ensure that you can always tell which towel was used to buff off which product, so you can avoid this tragic mistake from ever happening again!